Dmitry Buchenkov. Source: Autonomous Action. 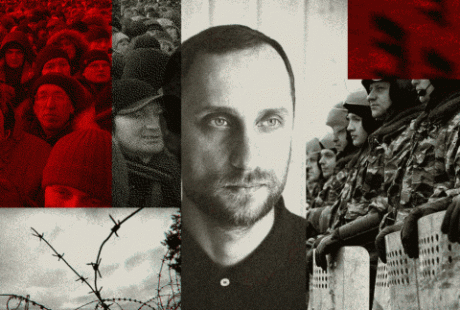 Dmitry Buchenkov has spent one and a half years in a Moscow detention facility. The 39-year-old, who holds a PhD in political science and worked as a research fellow at the Russian National Research Medical University prior to his detention, stands accused of participating in mass riots and assaulting police officers during the May 2012 protest rally on Bolotnaya Square. The Zamoskvoretsky District Court is currently considering his case, with Buchenkov himself having been under house arrest since March 2017. The left-wing activist’s pre-trial restrictions have been changed after Ildar Dadin, a fellow political prisoner, was pardoned in December 2016 — a development that has spurred talk of a “managed thaw” and a change in tactics on the part of the regime ahead of the presidential elections. In Buchenkov’s case, however, this step can hardly be called a thaw. On the day of the protests, the defendant was not in Moscow at all: he’d gone to Nizhny Novgorod to spend the weekend with his parents, as corroborated by relatives’ testimony and data from the State Traffic Safety Inspectorate. The case against Buchenkov has been constructed using testimony from secret witnesses and police officers passing themselves off as victims of violence on the square. The case rests predominantly on photographs and video footage featuring a black-sweatered man with an alleged resemblance to Buchenkov. Although an independent evaluation has refuted the investigators’ argument that this man is Buchenkov, the trial of the activist continues. I interviewed Buchenkov during his imprisonment. The prosecution is effectively misrepresenting you as a different person — someone who, according to the photographs, really was involved in clashes with the police. Are you angry with this individual for not coming forward to proclaim that an innocent man is behind bars? There are two sides to what I’m feeling. On the one hand, I understand that the state is persecuting me for my political convictions, and the chance to accuse me of the actions of the man from Bolotnaya Square is just a good pretext. On the other hand, the behaviour of that individual in the wake of my detention remains incomprehensible to me. I don’t want him to be locked up, but I can tell you how I’d conduct myself if I found out that someone was behind bars instead of me. I wouldn’t turn up professing my guilt. No need to spring this on the bureaucrats. But I’d definitely support the family of the arrested individual — I’d record a video message or something that I’d put online to say that an innocent person was being detained instead of me. This would represent a good opportunity to emphasise the officialism and cynicism of the police and to underscore the essence of the whole Bolotnaya affair in general. It’s been a year and a half since my arrest, but this person still hasn’t materialised. Are your fellow prisoners aware of what happened on Bolotnaya Square five years ago? What do you usually tell your cellmates about your case and about why people took to the streets in May 2012? In 15 months, I haven’t met a single prisoner who’s not aware of at least some details of the Bolotnaya affair. Probably because we’re in Moscow, and this is where it happened. But not everyone wants to delve into the details. Many prisoners have enough problems with their own cases. To be honest, I myself spent a good while trying to get to the bottom of what happened on Bolotnaya Square — after all, I wasn’t there. A more or less comprehensive idea of the affair crystallised in my mind when I read my own criminal case. Generally speaking, most prisoners hate the police, and are rather satisfied to learn that police officers have been roughed up somewhere. Footage from 6 May demonstrations in 2012. Source: Youtube. I’ve explained the demonstrators’ motivations by saying that people believed the 2012 presidential elections were rigged and were protesting against this. As regards my personal stance, it’s of far greater consequence for me that, starting from 2012, the regime’s authoritarianism has crystallised in definitive fashion, with Putin and his team proving themselves incapable of developing the country. What’s your cellmates’ attitude to the fact that you’re being persecuted for playing an active role in public life? It’s fine. In prison, it’s not too important whether you’re a political prisoner or just a normal prisoner — it matters far more what kind of a person you are. I’m capable of joining the collective while still remaining the person I am. It was important for me to demonstrate that I’m not just a normal person, but that I’m a normal person with certain beliefs, and that it’s not particularly important whether or not these beliefs are shared by anyone else. When you’re behind bars together for prolonged period of time, politics often recedes into the background — everyday issues become more important. Prisoners do engage in political debates from time to time, of course. During my first six months in jail, I took part in such debates myself. Dmitry Buchenkov. Source: Personal archive.But when you’ve settled into your cell, you get a fairly good idea of who has what views. Inward tranquillity is more important than any desire to create a scene, so issues that don’t seem consequential on the outside come to loom large: everyday problems; the need to get ready for a court hearing; prison news (someone slit their wrists, someone hanged themselves, someone overdosed, someone went into solitary confinement). As a prisoner, do you experience a lack of access to news? I do. The information I get from television isn’t enough for me. Friends have subscribed me to Novaya Gazeta, Kommersant, Nezavisimaya Gazeta and the New Times magazine, but print media doesn’t compensate for this lack. On the outside, I’d always be sifting through several news sources and social media networks, but you don’t get the chance to do that in prison. You have a PhD in political science. Would it be fair to say that you’ve now acquired a practical knowledge of the workings of Russia’s political system? Of course. I’ve grown even firmer in my conviction that the state machine is a system of organisation that benefits only a small group of people. That this system occasionally does something useful (in addition to causing obvious harm to society) by no means serves to justify it. The theory of civic self-government, in my opinion, is what could usher in a great future. But this theory needs to be perfected. First off, I don’t believe in the notion of a “people’s state” in a country like Russia. The so-called “people’s state” is possible in a small European country with developed institutions of grassroots self-government. Irrespective of who comes to power in Russia, the logic of a vast landmass — and the need to hold on to it — will inevitable make any “people's power” authoritarian in nature. Federalism, as evidenced by the experience of the last quarter-century, failed to work here. What’s possible in Russia is either a rigid vertical of power or confederalism. Secondly, a revolution isn’t theoretically required to democratise a political system. But analysis of the state’s actual actions suggests to me that “theoretically” is the operative word here. In practice, the ruling class is driving the situation towards a bourgeois revolution. Speaking in Marxist terms, this revolution will be a clash of two classes: the bourgeoisie and the bureaucracy. In the context of today’s situation, I am, of course, using the term “bourgeoisie” in a somewhat loose sense. The structure of contemporary Russian society calls for a more subtle wording. On the whole, I have a profound antipathy for the state system of the Russian Federation. Not for the country as such, I must emphasise, but for the bureaucratic system, which has impudently taken it upon itself to speak on behalf of the entire people. My thoughts vis-à-vis the workings of this system have been confirmed in practice. I’m currently writing a book in which I expound the results of my observations; it represents an idiosyncratic attempt to analyse Russia’s investigative and judicial systems from the point of view of political sociology. What do you have to do in order to remain mentally sharp when in isolation? Is it possible to spend this time productively? You need to do exercise during your hour outdoors, and when you’re back in your cell you need to read. Initially, I read fiction, but then I asked my friends to send me other books. I read, among other things, a work by Gabriel García Márquez – Clandestine in Chile: The Adventures of Miguel Littín in Chile – that I’d not previously been familiar with, as well as Livy’s History of Rome. When you’re in prison, though, you need to read in moderation, because reading fences you off from the people who surround you, and you shouldn’t really let that happen. You can’t isolate yourself from the collective — you need to exist within it. Self-education is possible behind bars, but a lot depends on what type of regime you’ve been placed within. I’ve heard that, in theory, already-convicted prisoners have the opportunity to access higher education remotely. I don’t know how this works in practice, but I do think many prisoners would take advantage of it. 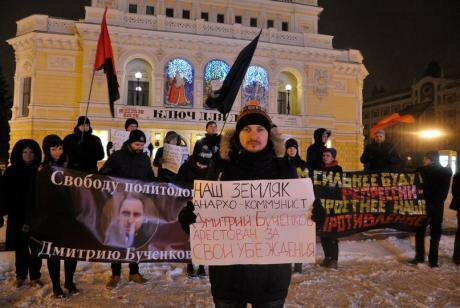 December 2015: activists in Nizhny Novgorod protest against the detention of Dmitry Buchenkov. CC: avtonom.org.If you engaged in self-education on the outside, it’s something you can carry on doing in prison as long you’ve the desire to do so. But if you had a crazy lifestyle on the outside and aren’t an idea-driven person, self-education isn’t likely to be something you’ll undertake behind bars — for that to happen, you’d have to undergo a profound change. The foremost challenge for prisoners is to preserve what they already have. If you’re facing a prolonged investigation and then a trial, this is going to have an impact your life. So staying in good health is a top priority. What incarceration conditions do you have? I’m subject to a special regime, which means my incarceration conditions are harsher: video cameras in the cells, a stricter enforcement by the administration of internal rules of conduct, no communication channels between prisoners you’d typically have in most prisons. This regime is used for criminal kingpins, individuals incarcerated for “serious” and “particularly serious” offences, and prisoners they want to keep in isolation (for whatever reason). In 15 months, I wasn’t allowed a single meeting with my family, and given permission to make no more than two phone calls. But there are pluses to the special regime as well. For example, the cells don’t tend to be overcrowded — generally, the number of prisoners corresponds to the number of available sleeping berths. The food’s better as well. But the biggest downside is that you’re effectively in complete isolation, without contact with the outside world. As regards cellmates, I’ve mainly been around people who’ve been accused of fraud as well as those detained under Article 228 [purchase and possession of drugs in large quantities] — people facing sentences from ten years to life. There’ve been some interesting interlocutors among them. Prison is actually an interesting place in the sense that you can encounter a whole host of different people here. What’s the most difficult thing about being in custody? The most difficult thing for me is the journeys from jail in the prison truck — across Moscow through the traffic jams to the court building and back again. That’s genuine torture. It’s hard to get used to that, and it took me five trips before I more or less came to terms with it. I know that in other Moscow detention centres, these trips aren’t such exhausting undertakings. There are problems with medicine, too — there’s practically no access to it. Getting ill in prison is a real disaster. I suffered from headaches, for example. Of the ten occasions I sought help, I received it twice, but only because the prison officials who happened to be on duty at the time were sane. Do you think that street protests — currently becoming more frequent in Russia — can grow into a larger-scale phenomenon in present-day conditions? There’s always a chance. But we need to work hard and to realise that social movements are only capable of advancing the most general demands. In the absence of a competent and decisive political core, formulating a coherent alternative and implementing it consistently becomes impossible. 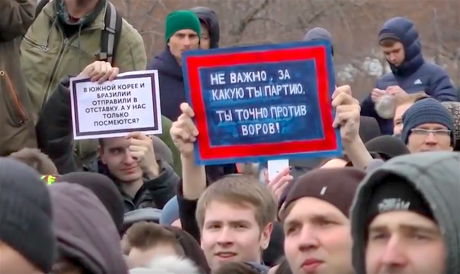 “It doesn’t matter what party you’re for – you’re certainly against thieves!” reads this placard at a protest in Moscow, 26 March. Image still via Radio Svoboda / YouTube. Some rights reserved.Left-wing organisations should concentrate all their efforts on getting their foot in the door when it comes to these protests. In order to do so, these organisations have to overcome two challenges: they’ve got to stop thinking schematically and bring something of their own to the table. Revolutionaries cannot and should not enter social movements with empty hands and holes in their pockets. If you read around the history of the revolutionary movement in late 19th and early 20th century Russia, you’ll soon see that this movement boasted an underground infrastructure and attracted interest from various social strata, from army officers and workers to members of the aristocracy. For a movement to get to this level, you need intelligence, determination and originality. In and of itself, a capacity for self-sacrifice isn’t enough. Can the anti-corruption agenda serve to unite Russian citizens? It can, but for a very short period. After all, Russia’s problems aren’t limited to corruption. When we talk about corruption, we inevitably have to ask ourselves the question of how to go about vanquishing it. The policies being pursued by the country’s leadership aren’t yielding tangible results in this regard. Corrupt officials are formally being countered by other officials, and this paradigm of “bees against honey” isn’t going to work. To combat corruption effectively, you need to adopt radical measures, but measures that will be systematically transformative rather than repressive. Russia’s current political élite cannot afford to go down this path since it would thereby bring down its own power. Certain commentators believe that Russia is witnessing a so-called “political thaw”, with the pardoning of Ildar Dadin in December 2016 symptomatic of this development. Would you agree with this thesis? On the whole, yes, I would. But this is a temporary phenomenon. The state machine is a tentacled monster, with each individual tentacle unaware of what the others are doing. This monster lives by instincts. Perhaps it’s burnt a tentacle somewhere and decided to behave in a more cautious manner. This is a metaphor, of course, but I do think that neither Ildar Dadin nor myself pose any danger for the monster at this moment in time. A distant threat is brewing for the ruling classes, but they believe they’re currently in control of the situation, and that keeping civil activists behind bars therefore means handing people yet more ammo for criticism.